Because Jesus drank from the cup of suffering and wrath, that cup became the cup of salvation. The cup of suffering became the cup of joy. Turns out, it’s the same cup. Hebrews 12 says that it was for the joy that was set before Him that Jesus endured His tortuous death on the cross. But to get to the joy, He first had to be willing to drink the cup of suffering. In the midst of His excruciating pain, Jesus fixed His gaze on His Dad and held on to the joy that He knew was coming to Him on the other side of the cross. 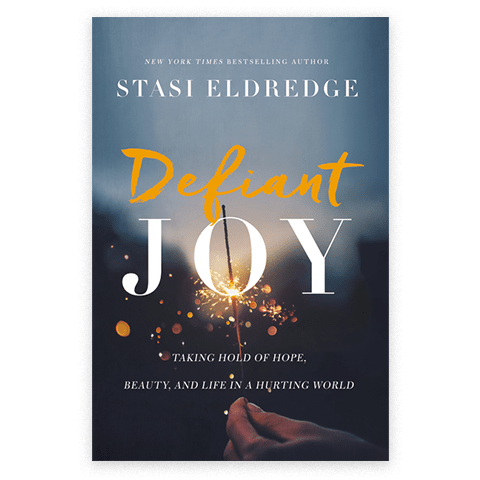 He showed us that we, too, can have joy in the midst of our suffering because of the joy that is set before us—and no one can take it away from us. No one and nothing can take away our future joy at the grand reunion that is going to take place when Christ returns and all things are made new (Rev. 21:5). Endless life, eternally satisfying and delightful, is headed our way. Jesus led the way with His death and resurrection, and that joyful new life is promised to us as well. But remember, friends, to get to the resurrection, we have to pass through the crucifixion. We will suffer, but we will never suffer as Jesus did—ever—because Jesus drank the cup of wrath for all the sins of all mankind. Though we will suffer, it will always be under a canopy of grace and love, never wrath and judgment. This is the cup that Jesus invites us to partake of as He did. It is no mythic holy grail that we must search for in order to find eternal youth and infinite joy. This cup is real. We drink of it to remember Him when we celebrate the Last Supper, proclaiming His death and resurrection until we see Him again. We drink of it to proclaim as they do in the Episcopal mass, “The blood of Christ, the cup of salvation.” We take up the cup to join in the fellowship of Jesus and all the saints who precede us with a hope that is untouchable. We take up the cup of blessing, and as we do, we sing as David did, “I will lift up the cup of salvation and call on the name of the lord” (Ps. 116:13). And, finally, we drink of the cup because we would not shun any of that which Christ deems necessary to shape us into His image. We can rejoice over that.